Two supreme court justices are dead. Their murders are connected only in one mind, and in one legal brief conceived by that mind. Brilliant, beautiful and ambitious, New Orleans legal student Darby Shaw little realises that her speculative brief will penetrate to the highest levels of power in Washington and cause shockwaves there. Shockwaves that will see her boyfriend atomised in a bomb blast, that will send hired killers chasing after her, that will propel her across the country to meet the one man, investigative reporter Gray Grantham, who is as near the truth as she is. 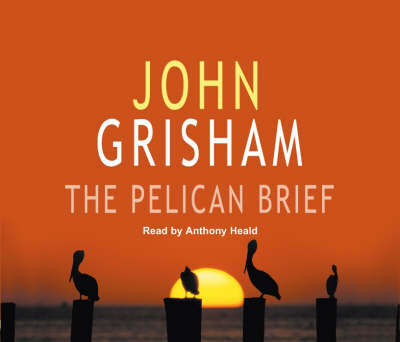 Together, can they stay alive long enough to expose the startling truth behind The Pelican Brief? "The Last Juror: 'Terance Mann's reading is Atticus Finch with knobs on, a really great performance' Guardian"
"The King of Torts: 'Ruthless calculation and overpowering greed make the story of Clay Carter's dizzying rise to "king of torts" a cracking good tale' Sunday Times"
"The Brethren: 'A riveting tale, well up to Grisham's normal high standard, expertly read by Michael Beck' Scotsman"